Cats Whiskers (Orthosipon spp) is a plant of medicinal plants such as shrubs. Cats Whiskers plant height could reach 2 meters or more. Cats Whisker plant stems quadrangular, no plot, but does not seem real. 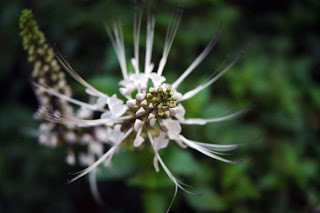 You can learn more easily Cats Whisker plant with spotty leaves and flowers. Cats Whisker-leaves is a distinctive oval-shaped, lanceolate, oval, narrowing at the edges, though some are boring. Especially if you see flowers Cats Whisker, a very conspicuous presence of elongated white hairs, which tend to be straight flat, although there are vertically upwards and down a bit. Curiously, the cats whiskers plants has considerable benefits as medicine to treat various types of diseases. Let's see if so, perhaps it is not his illness, family, relatives, friends, which can be cured with plants cats whiskers. 1. Rationalization of the costs of urine (diuretic). 8. Inflammation of the Kidneys. You can use traditional or modern methods. That's the traditional way, you mix the Cats Whisker and herb plants mixed with other herbs, such as herbal medicine made him drink. In the modern, you can enjoy plants Cats Whisker in pill form that is ready to drink. I take the example of one Cat Whisker plants used in medicine to accelerate the spending. For those of you who like to write a little but often. Traditionally, take leaves Cats Whisker, Meniran, and roots of reeds each 30 grams. Third material is washed, cut as necessary and then boiled in three cups of water. Let it boil, until the only remaining half of the initial volume. Drink water as much as half a cup of herbs, with a frequency of three times a day. Feel the benefits.